Surfrider is all about grassroots volunteering, that means getting people involved in activities and outreach in our local community and state, and helping them take the lead on creating change! There’s always something you can help out on, and if you have a good idea or know of an opportunity, let us know. Kelly Wolfe is Coos Bay Surfrider’s Volunteer Coordinator. You can always email Kelly with questions or your idea, and she’ll connect you with opportunities. 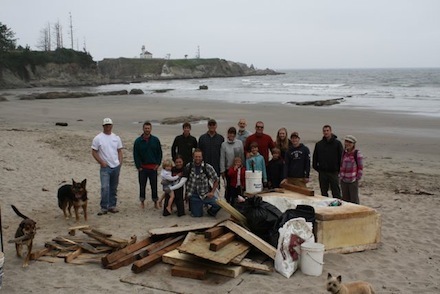 Monthly Surfrider Meetings: The Coos Bay Chapter meets the 1st Thursday of each month at 6:00 pm, generally at the Broadway Theater Rock Hall (226 S Broadway, in Coos Bay, just north of Sharkbites Cafe.) Sometimes we meet at an alternate location – check the events calendar to make sure. There’s a lot of socializing, often an interesting presentation, and lots of volunteer opportunities to sign up for. Our meetings are open to the public. No need to RSVP! Minors (under the age of 21) are welcomed to join us, for details on each meeting contact chair@coosbay.surfrider.org or visit our events calendar.